Grand Graduation Gift Baskets for Her! 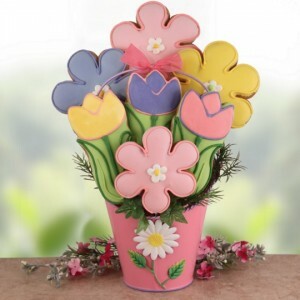 Flowers Cookie Bouquet – Why choose between a bouquet of flowers and a cookie bouquet when you can opt for the most flavorful fusion of both? This charming cookie gift includes 7 generously-sized gourmet cookies ‘potted’ inside a reusable pail embellished with a daisy. Unlike regular flowers that begin wilting after just a few days, these only disappear in the most delicious way possible – by savoring every sweet bite and sugary crumb! Flavors include: Vanilla Sugar, Honey Vanilla Sugar, and Lemon Sugar. Coffee Gift Basket – Just because those long, coffee-fueled nights of studying are a thing of the past doesn’t mean she’s going to give up on that most delicious brew! And what better way to enjoy her favorite coffee, or one of the 2 included gourmet blends, than by sipping it slowly from our Flitter Flutter 13 oz. mug? 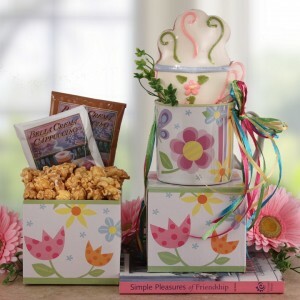 Also included are a touching book titled Simple Pleasures of Friendship, and Colorado Kernels gourmet popcorn. We’ve also tucked in the perfect complement to a fresh cup of joe – a 4 ½” hand decorated cookie! Champagne Gift Basket – When you really want to help the recent grad celebrate her accomplishments in sparkling style, our Champagne Elegance gift basket is in order! Graduation is among the most momentous occasions we can experience in our lives, and we don’t think it’s the right time for a bargain bottle of bubbly! 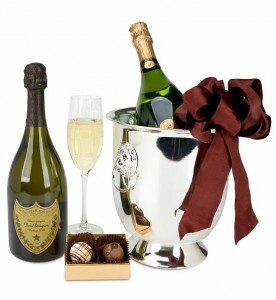 That’s why our champagne gift baskets are crafted to include your choice of 2 fine champagnes – Domaine Ste. Michelle or world-famous Dom Perignon. Whichever you choose will be shipped in a shiny, classic chiller for the most remarkable presentation, alongside decadent dark chocolate champagne truffles. While this is a luxury gift basket, it makes a perfect present to gift as a group to keep within a smaller budget. 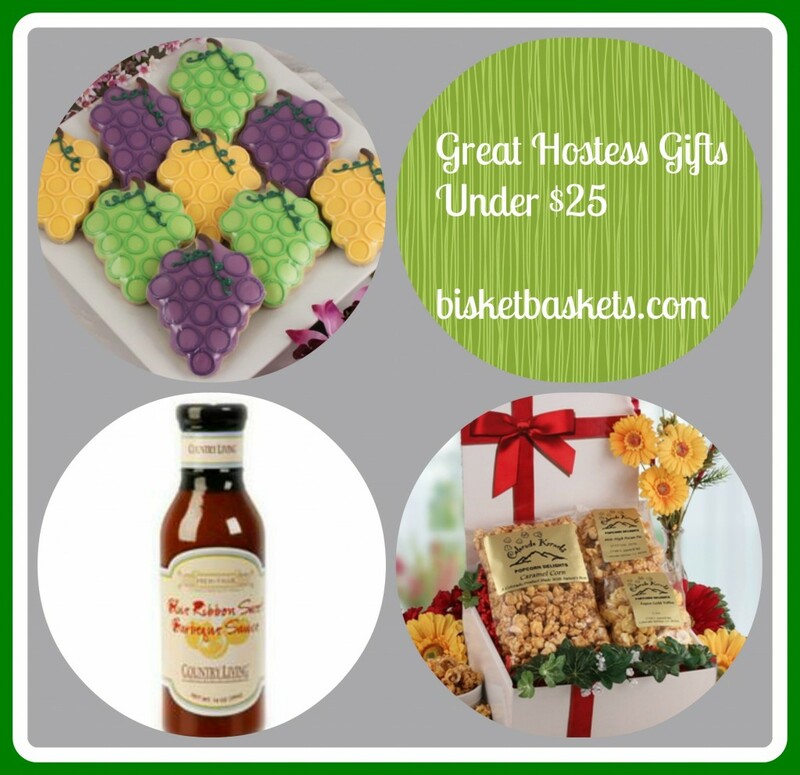 Great Hostess Gifts Under $25: Perfect for Memorial Day Get-Togethers! Have you been fortunate enough to receive an invite to a Memorial Day get-together? We hope you have! For as magical as Christmas is, and as festively fun as Halloween, there’s something special about coming together on holidays that honor the many brave men and women who have made our country the uniquely wonderful and free place it is today. While many observe Memorial Day’s meaning by visiting cemeteries and memorials, it has increasingly become a day to gather together with family and friends for a relaxing day of eating and simply enjoying each other’s company. Of course, there is always the option of observing Memorial Day both ways, dedicating time to those we have lost as well as those we are blessed to still have with us. Country Living Blue Ribbon Sweet BBQ Sauce – Richly sweet, smokey and spicy, this generously-sized bottle of barbeque sauce will be the best thing that ever happened to chicken, ribs and more! Gourmet Popcorn Gift from Colorado Kernels – Gourmet popcorn has never been hotter than it is now, due in large part to the decadent variety of options available, like those found in this popcorn gift set! One of our favorite fellow Colorado businesses, this gift is packed with popped perfection from Colorado Kernels. Flavors include: Caramel, Aspen Gold Toffee and Mile High Pecan. In other words, Yum, Yum and Yum! Vineyard Cookie Bouquet – Available with your choice of 3, 5, 7, 9 or 12 cookies, these hand-decorated indulgences are more than just pretty – they’re oh-so-delicious! Whipped up in flavors of Honey Vanilla Sugar, Vanilla Sugar, and Lemon Sugar, each is a memorable dessert unto itself. Your host or hostess is sure to hide these away from the kiddos so they can savor every last morsel!